There is no specific time and place to pinpoint the origin of tug of war. The contest of pulling a rope originates from ancient ceremonies and cults, which are found all over the world, such as in Egypt, Burma, India, Borneo, Japan, Korea, Hawaii and South America. 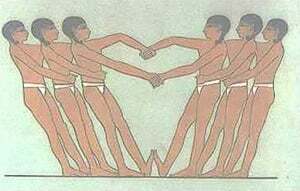 The ancient tug of war was performed in various styles. In Afghanistan, teams used a wooden stake instead of a rope to pull. In Korea, children clasped their arms around each other’s waists to form a living tug of war chain. Tug of War was not only a team sport. In several countries a man to man version of tug of war existed. The Canadian Eskimos still have a tug of war contest known as ‘arsaaraq’. It’s a tug of war contest with the pullers sitting on the ground, using a short rope. The one who pulls his opponent over from his seated position is the winner. Later tug of war became a pure contest of physical strength. In Greece, the cradle of the ancient Olympic Games, tug of war sport around 500 BC was practised by athletes either as a competitive sport or as an exercise in the physical training for other sports. In Western Europe evidence of tug of war is found in the year 1000 AD, in the stories of the heroic champions of Scandinavia and Germany, who participated in the so called ‘kräftige spiele’ (power games). The tug of war sport featured at the courts of the Chinese Emperors, as well as in Mongolia and Turkey. In the 15 was a popular contest in tournaments in the French Chateaux and in Competitions in the UK.th Century tug of war. In 1920 the IOC (International Olympic Committee) took a decision to reduce the number of participants of the Olympic Games and for that reason deleted a number of team sports from the programme, sadly, including tug of war. In 1999 the Tug of War International Federation (TWIF) of which the Tug of War Association is a founder member, received provisional IOC recognition again, which was confirmed in 2002 into formal recognition in accordance with rule 29 of the Olympic Charter. Tug of war remains as a recognised sport by the IOC and the Tug of War International Federation (TWIF) is the recognised world governing body for the tug of war sport. 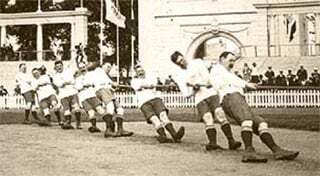 Fortunately tug of war was still practised in many countries and resulted in national organisations being formed, the first being Sweden in 1933, then The Tug of War Association of England in 1958, and soon after many other countries followed suit. After tug of war was no longer on the programme of the Olympic Games, the opportunity to participate in international competitions had disappeared. With the foundation of national tug of war associations, the need for international competition developed simultaneously. The decision to form an international federation was taken in 1960 by George Hutton of The Tug of War Association of England. In co-operation with representatives from the Swedish association, the idea was brought into reality. The first international competition was staged at the Baltic Games in Malmö, Sweden. The Tug of War International Federation (TWIF), participated with four countries; Great Britain (represented by Wood Treatment Bosley from Cheshire), Sweden, Netherlands and Denmark. After the first international competition in the Baltic Games, TWIF organised in 1965 its first European championships in Crystal Palace, London. From that year on, with regular intervals, European Championships were staged until 1975, when countries from outside Europe affiliated to TWIF, resulting in the first World Championships in the Netherlands. Currently TWIF organises World Championships every 2 years. European Championships are organised in the intervening years.